First free space walk from one spacecraft to another. First rendezvous with two different spacecraft in one flight. Altitude (763 km) record. Exciting mission with successful docking with Agena, flight up to parking orbit where Gemini 8 Agena was stored. Launched: 1966-07-18. Returned: 1966-07-21. Number crew: 2 . Duration: 2.95 days. Location: Norwegian Technical Museum, Oslo, Norway. Exciting mission with successful docking with Agena, flight up to parking orbit where Gemini 8 Agena is stored. Collins space walks from Gemini to Agena to retrieve micrometeorite package left in space all those months. Loses grip first time, and tumbles head over heels at end of umbilical around Gemini. Package retrieved on second try. The Gemini X mission began with the launch of the Gemini Atlas-Agena target vehicle from complex 14. The Gemini Agena target vehicle (GATV) attained a near-circular, 162- by 157-nautical-mile orbit. Spacecraft No. 10 was inserted into a 145- by 86-nautical-mile elliptical orbit. Slant range between the two vehicles was very close to the nominal 1000 miles. Major objective of the mission was achieved during the fourth revolution when the spacecraft rendezvoused with the GATV at 5 hours 23 minutes ground elapsed time and docked with it about 30 minutes later. More spacecraft propellant was used to achieve rendezvous than had been predicted, imposing constraints on the remainder of the mission and requiring the development of an alternate flight plan. As a result, several experiments were not completed, and another secondary objective - docking practice - was not attempted. To conserve fuel and permit remaining objectives to be met, the spacecraft remained docked with the GATV for about 39 hours. During this period, a bending mode test was conducted to determine the dynamics of the docked vehicles, standup extravehicular activities (EVA) were conducted, and several experiments were performed. 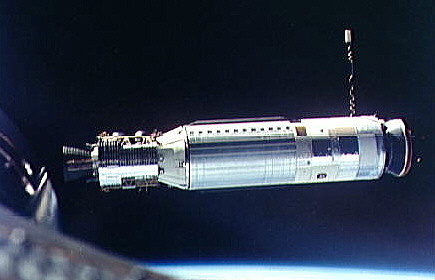 The GATV primary and secondary propulsion systems were used for six maneuvers to put the docked spacecraft into position for rendezvous with the Gemini VIII GATV as a passive target. The spacecraft undocked at 44 hours 40 minutes ground elapsed time, separated from the GATV, and used its own thrusters to complete the second rendezvous some three hours later. At 48 hours and 42 minutes into the flight, a 39-minute period of umbilical EVA began, which included the retrieval of a micrometeorite collection package from the Gemini VIII Agena. The hatch was opened a third time about an hour later to jettison extraneous equipment before reentry. After about three hours of stationkeeping, the spacecraft separated from the GATV. At 51 hours 39 minutes ground elapsed time, the crew performed a true anomaly-adjust maneuver to minimize reentry dispersions resulting from the retrofire maneuver. The retrofire maneuver was initiated at 70 hours 10 minutes after liftoff, during the 43rd revolution. The spacecraft landed within sight of the prime recovery ship, the aircraft carrier Guadalcanal, some 5 km from the planned landing point on July 21. After the premission review, the traditional meal, and the ritualistic suiting up, Young and Collins left the crew quarters on 18 July 1966 for pad 19 - to begin the most complex manned flight so far. They had been awakened at noon for a 5:20 p.m. takeoff, when a 35-second window offered the best chance for rendezvous with the two Agenas. The Atlas lifted its payload toward space at 3:39 p.m., just two seconds late. One hundred minutes later, the Gemini launch vehicle boosted the spacecraft skyward exactly on time. Except for a slight shaking and a buzzing in their ears, Young and Collins had a nice ride to start chasing their first target. At entry into orbit, Gemini X trailed its Agena by 1,800 kilometers. Flight Director Lunney told the crew they were all set for a fourth-orbit rendezvous. Collins unstowed a Kollsman sextant to sight on selected stars for an attempt at optical navigation. Young pointed the spacecraft while his crewmate tried to find the horizon. Collins realized that he was using the wrong reference when he saw stars below the line. He had been mistaking the airglow, a band of radiant light from the upper atmosphere, for the horizon. Even after he corrected this, Collins could not get the lens of the sextant to work properly, as the optical image of the stars did not agree with what he had been taught. He laid the Kollsman aside and tried an Ilon instrument, but that was little help as the Ilon had a severely limited field of view. Young and Collins checked their figures with Lunney, who had been watching their activities carefully through telemetry. When the trio found that the numbers did not agree with those of the ground computers, Gordon Cooper, the Houston CapCom, passed the word that the crew would have to use the ground computations. Young then fired the thrusters to adjust their orbit to 265 by 272 kilometers. When he aligned the platform for the terminal phase, the command pilot did not realize that the spacecraft was turned slightly. As he thrusted toward the target, Young needed two large midcourse corrections. The spacecraft path toward the Agena was not lined up properly. So he had to stop thrusting briefly and take off on a new track. The final translational maneuvers to reach the Agena cost nearly 181 kilograms of fuel, or three times more than any earlier mission. Five hours and 52 minutes after launch, Young reported a rigid dock. "At first, the sensation I got was that there was a pop (in front of our eyes), then there was a big explosion and a clang. We were thrown forward in the seats. We had our shoulder harnesses fastened. Fire and sparks started coming out of the back end of that rascal. The light was something fierce, and the acceleration was pretty good. The vehicle yawed off - I don't remember whether it was to the right or to the left - but it was the kind of response that the Lockheed people had predicted we would get. . . . The shutdown on the PPS (primary propulsion system) was just unbelievable. It was a quick jolt. . . and the tailoff. . . I never saw anything like that before, sparks and fire and smoke and lights." 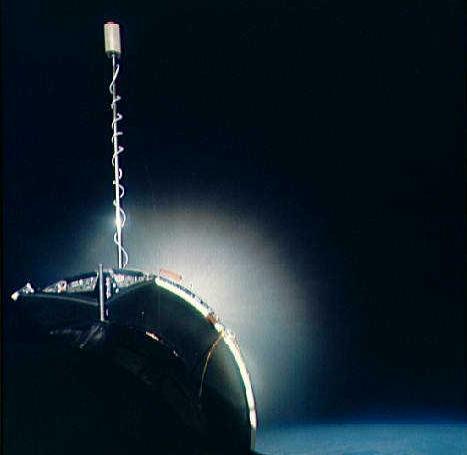 Gemini X reached an orbit that measured 763 kilometers at the top and 294 kilometers at the bottom. The Agena had pushed the spacecraft more than 463 kilometers above its initial apogee. Young and Collins now viewed Earth from a higher elevation than any human beings ever had. Instead of gazing at the Planet in wonderment, however, they confined their attention to their own little, artificial world. They watched spacecraft systems and kept an eye on the radiation dosage readings (which were within tolerable limits). During his technical debriefing, Young only reported, "We took some pictures at apogee. . . . I don't know where it was, but it shows the curvature of the Earth. . . . We took some pictures coming down hill. I think it was the Red Sea area." Thus, in rating one impression over the other - record high altitude versus Agena ignition - Young and Collins were more affected by the firing of the switch engine than they were by the unique vantage point they had reached. This lack of awe at their record height was caused, at least in part, by the fact that the switch engine blocked much of the downward view. When Young and Collins opened for business after 18 hours of flight, their spirits lifted as the CapCom at Carnarvon gave them the numbers for the next target vehicle firing. With the Agena/spacecraft combination faced about so the main engine would fire directly into the flight path, Young made a 78-second burn to reduce the velocity by 105 meters per second and lower the apogee to 382 kilometers. The pilots were again pressed forward in their seats, but this time they were impressed more by the firepower of the Agena than by its fireworks. "It may be only l g, but it's the biggest l g we ever saw! That thing really lights into you," Young commented. Like rendezvous maneuvers in the past, the next Agena burn (and the final one with the main engine) aimed at circularizing the orbit. At 22:37 hours, the target drove the spacecraft along the flight path to add 25 meters per second to the speed. This brought the low point of the orbit up to 377.6 kilometers - only 17 kilometers below Agena 8. Although rendezvous and docked maneuvers with the Agena were the high point of the first day, the crew also spent a good part of that time on the 14 experiments they carried. Twenty minutes after launch, the crew turned on a switch to start the tri-axis magnetometer (MSC-3). This device was used, as it had been in other flights, to measure the radiation levels in the South Atlantic Anomaly. Two other experiments were also devoted to radiation - MSC-6, beta spectrometer (mounted in the adapter to measure potential radiation doses for future missions), and MSC-7, bremsstrahlung spectrometer (installed in the cabin to detect radiation flux as a function of energy when the spacecraft passed through the South Atlantic Anomaly). Some of the experiments had to be done outside the spacecraft. Before the third Agena burn, Collins got ready for his first exposure to outer space, a standup EVA. Preparations went well and the hatch opened easily. At sunset, Collins stood in his seat, setting up a 70-mm general-purpose camera for S-13, a photographic study of stellar ultraviolet radiation. Collins aimed the camera at the southern Milky Way, scanning from Beta Crucis to Gamma Velorum, and exposed 22 frames. The entire night pass was devoted to this task. 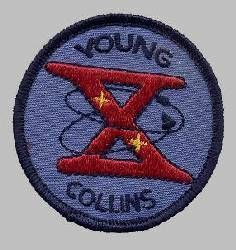 Young helped Collins identify the stars, at the same time controlling the spacecraft and target vehicle combination. With the beginning of daylight, Collins began MSC-8, color patch photography, to see if film could accurately reproduce colors in space. The pilot did not complete this assignment, however, as his eyes began to fill with tears. Young had the same problem. They suspected at first that the anti-fog compound inside their faceplates was irritating their eyes. They closed the hatch at 24:13 hours, about 6 minutes early. They had noticed a strange odor that they thought might have been the lithium hydroxide used in the environmental control system, but ground engineers finally concluded that their smarting eyes were caused by having both suit fans on at once. They turned one fan off and, at 30 hours elapsed time, began a second sleep period. Bone-tired this time, they rested well. "just like backing down the railroad track in a diesel engine looking at a big boxcar in front of you. . . . The big drawback of having the Agena up there is that you can't see the outside world. The view out of the window with the Agena on there is just practically zilch." "45:38. First sighting of Gemini VIII," Young said. "At this minute it's blurry." 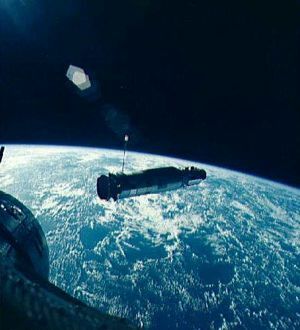 After the distance between the two vehicles had been calculated, the Houston CapCom (on the remote line through the Canton station) informed Young, "Your range, Gemini X, is 95 (nautical) miles (176 kilometers)." The crew then learned that what they had been looking at was their own Agena just 5.5 kilometers away. Houston offered consolation, "95 miles is a pretty long range," and Young answered, "You have to have real good eyesight for that." They didn't see the Gemini VIII Agena until it was 30 to 37 kilometers from them, looking to Young like "a dim star-like dot until the sun rose above the spacecraft nose." NORAD's constant care had paid off. They found Agena 8 just where it was supposed to be. At 47:26 hours Young started the final closure, with Collins computing the figures for two midcourse corrections. The crew found the old Agena pretty stable, and Young moved in to stationkeep about 3 meters above it. In less than 30 minutes, he told the Houston CapCom that they were going down for a closer look at the micrometeorite collection package. Back in Mission Control Center, fuel usage during stationkeeping was being very closely watched. When it proved to be reasonable, Gemini X received a go for the next extravehicular exercise. "Glad you said that," Young answered, "because Mike's going outside right now." So far, the umbilical had been snubbed so it would extend only 6 meters. The pilot now unsnapped the buckle that released the remaining 9 meters, intending to evaluate the gun. But the gun play stopped before it started. The Hawaii CapCom told Young, "We don't want you to use any more fuel (for stationkeeping)." Young replied, "Well, then, he'd better get back in." To Collins he said, "Come on back in the house." Getting back into the spacecraft was surprisingly difficult. Collins had gotten himself tangled in the umbilical. Since the pressurized suit made it difficult to see or feel just where the line had wrapped itself about him, he had to wait while Young helped unwind him and got him back into the seat. But fuel remained the big question. Houston called them, "just . . . to confirm that you're not using any fuel." Young replied, "We've got everything shut off." More was shut off than he realized. He soon discovered that the radio transmitter had also been turned off. By this time, Collins was back in his seat. Young reported that hatch closing had been easy. With the long lifeline coiling all over the cabin, Young thought it made "the snakehouse at the zoo look like a Sunday school picnic." A little over an hour later, the crew reopened the hatch and tossed out the chestpack and umbilical. This operation only took three minutes. McDonnell had done an excellent job on this righthand hatch. Because of the time spent struggling with the umbilical, Collins and Young had to hurry to get set up for an important maneuver that would make the point of reentry more precise. They carried out an orbit-shaping activity exactly on time, at 51:38 hours. This retrograde firing, of 30 meters per second, brought the spacecraft perigee down 106 kilometers, making the orbital parameters safe for reentry. After another round of experiments - this time synoptic terrain and weather photographs taken as the spacecraft drifted through space - the crew began their third sleep period. On awakening (about 63 hours into the flight) on homecoming day, Young and Collins spent more time on experiments and did their packing. Then, 70 hours and 10 minutes after liftoff, the crew felt the first retrorocket ignite as they passed over the Canton Island tracking station during their 43rd revolution. Reentry went remarkably well, with Young steering bank angles by computer solutions. Landing in the western Atlantic at 70:46 hours (4:07 p.m., 21 July 1966) was only 5.4 kilometers from the aiming point. The crew of the primary vessel, the Guadalcanal, watched the spacecraft hit the water. Once the swimmers had attached the flotation collar and positioned the raft, Young and Collins climbed out. They were lifted by helicopter to the deck of the recovery ship. With that part of the mission completed, the flight controllers put the Gemini X Agena through its paces. Over a 12-hour period, the main engine was fired twice and the small engine once. Since the first maneuver was intended to study temperatures at higher altitudes, the controllers sent the Agena up to a 1,390- by 385-kilometer orbit. They watched it for almost seven hours and found that the temperatures varied little from those at lower orbits. The vehicle was then returned to a circular orbit (352 kilometers) that would make it available as an alternate target for later flights. Gemini IX-A and X had successfully grappled with some of the specific needs of the Apollo program, acquiring operational experience while fostering healthy debates between the two programs on procedures and equipment. Perhaps the greatest benefit to Apollo was the demonstration and practice of several types of rendezvous. Each provided a storehouse of information. In addition, the orbit-shaping maneuvers to the higher altitudes established that the trapped-radiation hazards could be avoided on trips into deep space. Then, too, the very fact that one spaceborne vehicle could meet another, latch onto it, and use it as a kind of space tug offered many possibilities for such space flight concepts as shuttles, space stations, and space laboratories. By the end of Gemini X, many of the men and women who had worked full time on the program had begun to have a strong feeling of anticlimax and to wonder about their next jobs. Some had already gone on to other fields, but Mathews tried to control this exodus and to hold enough together to finish the flights. Shortly after IX-A, he told his staff that the Gemini Program Office, as such, would not be continued. The people would be absorbed into other MSC activities - mainly Apollo and Apollo Applications. By early August, a personnel placement committee had begun work. It soon arranged four to six interviews for each of the 193 project office people. This allayed any immediate fears, but Mathews still warned his staff to refrain from making personal contacts for new jobs until the committee could complete its arrangements. There were two more flights in the Gemini program, but it already seemed to be heading into history. Family: Manned spaceflight. People: Collins, Young. Country: USA. Spacecraft: Gemini. Launch Sites: Cape Canaveral. Agency: NASA Houston. 1966 January 25 - . 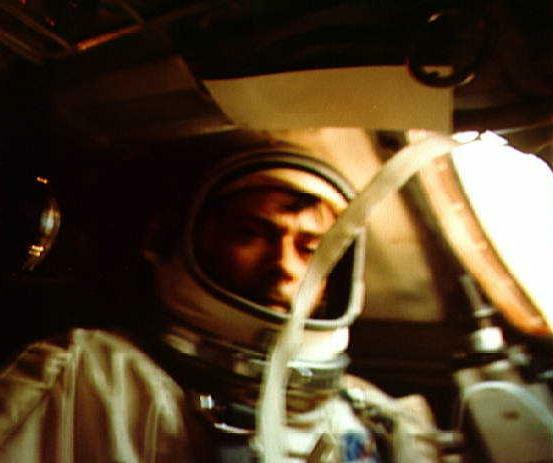 Astronaut John W. Young had been selected as the command pilot for Gemini X. - . Nation: USA. Flight: Gemini 10. Spacecraft: Gemini. The pilot would be Astronaut Michael Collins. The backup crew would be James A. Lovell, Jr., command pilot, and Edwin E. Aldrin, Jr., pilot.. Launch dates for Gemini X - XII. - . Nation: USA. Flight: Gemini 10, Gemini 11, Gemini 12. Spacecraft: Gemini. Gemini Program Manager Charles W. Mathews reported the launch dates tentatively scheduled for Gemini X as July 18, for Gemini XI as September 7, and for Gemini XII as October 31, 1966. .
1966 May 13 - . Gemini spacecraft No. 10 delivered to Cape Kennedy - . Nation: USA. Flight: Gemini 10. Spacecraft: Gemini. McDonnell delivered Gemini spacecraft No. 10 to Cape Kennedy. Installation of fuel cells was completed May 18, and that of the pyrotechnics, May 25. Preparations for Plan X testing were completed June 1, and the spacecraft was moved to Merritt Island Launch Area June 3. 1966 June 7 - . The acceptance meeting for target launch vehicle (TLV) 5305 was held at General Dynamics/Convair in San Diego. - . Nation: USA. Flight: Gemini 10. Spacecraft: Gemini. The acceptance meeting for target launch vehicle (TLV) 5305 was held at General Dynamics/Convair in San Diego. TLV systems test had originally been completed March 25. During the next two months, TLV components were reworked to the latest flight configuration. Systems tests were then rerun, May 26-June 1, followed by composite test June 2-3. Following acceptance, the vehicle was shipped by air on June 9 to Cape Kennedy; this was the first TLV to be transported by air to the Cape, and it arrived the same day. 1966 June 9 - . Gemini spacecraft No. 10 was moved to complex 19 and hoisted to the top of its launch vehicle. - . Nation: USA. Flight: Gemini 10. Spacecraft: Gemini. Cabling for test was completed June 13. Premate verification, as well as fuel cell activation and deactivation, were completed June 16. Preparation for integrated tests with the launch vehicle was accomplished the following day..
1966 June 15 - . Atlas 5305, target launch vehicle for Gemini X, was erected at launch complex 14. - . Nation: USA. Flight: Gemini 10. Spacecraft: Gemini. Electrical power was applied June 17, and subsystem testing was completed June 28. During propellant system checks, a leak was discovered in the fuel start tank. Access to repair the leak required removing the sustainer engine and the fuel tank apex cone..
1966 July 19 - . 21:44 GMT - . EVA Gemini 10-1 - . Crew: Collins. EVA Duration: 0.0347 days. Nation: USA. Related Persons: Collins. Class: Manned. Type: Manned spacecraft. Flight: Gemini 10. Spacecraft: Gemini. Stand-Up External Vehicular Activity. Photographed earth and stars..
EVA Gemini 10-3 - . Crew: Collins. EVA Duration: 0.0007 days. Nation: USA. Related Persons: Collins. Class: Manned. Type: Manned spacecraft. Flight: Gemini 10. Spacecraft: Gemini. Internal Vehicular Activity. Threw excess equipment out of spacecraft..
1966 July 20 - . 23:01 GMT - . EVA Gemini 10-2 - . Crew: Collins. EVA Duration: 0.0271 days. Nation: USA. Related Persons: Collins. Class: Manned. Type: Manned spacecraft. Flight: Gemini 10. Spacecraft: Gemini. Retrieved micrometeoroid collector from Agena..
1966 July 22 - . Voskhod 3 still on? - . Nation: Russia. Program: Voskhod. Flight: Gemini 10, Voskhod 3. Spacecraft: Gemini. Following the meeting with Mishin, Kamanin promises that the Voskhod 3 mission will be quickly revived and that the crews should refresh their training with the objective of a flight by 15 September. Kamanin notes the successful completion of the very ambitious Gemini 10 mission, which clearly shows the American intention to master space.